Dear Sara, as you can see here I am once again visiting your website. I thank you, as always, for your thoughtful replies. Today I want to tell you about something that happened yesterday morning. My mood was heavy, I was worried for my eldest daughter, with whom often I am not able to communicate very well, I feel inadequate, frustrated, and while I was thinking of all these things, I was washing the dishes from the night before, I asked my Angels to help me feel better. 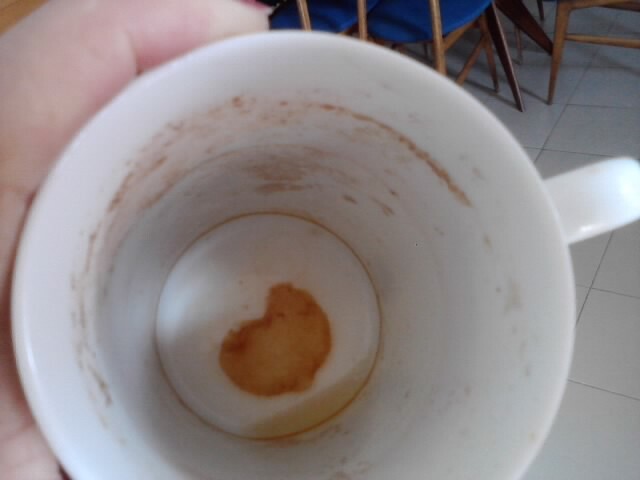 I asked with so much fervor … and so in that moment I took a tea cup to wash it and as I was about to place the pad inside the cup in order to wash it, I saw this! But the little heart in the cup gave me the confirmation I was looking for, that gave me so much “solace”; the Angels listen to me and I thank them with all of my heart, and the more I turn to them, the closer I feel they are to me! I am thankful that you are all there and that I can share this experience with you! Sara, may the eternal energy of the Light soon melt away all the obstacles you are encountering with launching this new website.